There are many stories about secret ancient tunnels prodding deep into the Earth. The mystery is who made them, why were they made, and where do they lead? Since they lack proper oxygen, continue on for miles without a sign of ending, and in many cases are found to be blocked by collapsing ceilings or walls, potential exploration of such burrows has ended in failure. The authors of such stories can only speculate. But nobody knows; or do they? There is a collaborating hypothesis, shared by a lot of people, that the Earth may be hollow. Ancient folklore is laced with stories about an underworld. The Christians believe that Hell is located there, Kabalistic literature describes an “inner earth,” and the Buddhists speak of Agharta, a subterranean empire filled with cities. 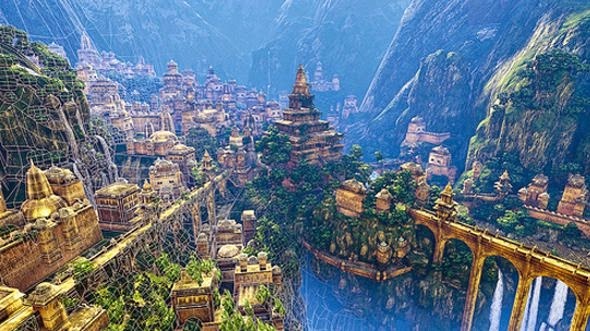 The Buddhists say that many tunnels lead from South America and Tibet into Agharta, a complex of cities and tunnels occupied by a super race of beings. For years I have been reading strange stories about how Admiral Richard Byrd flew into some kind of a vortex, or entrance to another world in the center of the Earth during one of his exploratory expeditions to the North Pole. And then there is the Hollow Earth Society of believers. But I always thought it was some kind of a gag. Something like the Church of Bob. It involves a number of "believers" who share a "tongue-in-cheek" joke that goes to the extreme. But if it is a joke, someone forgot to tell the late explorer Steve Currey, of Provo, Utah. Currey, who traveled some of the toughest rivers of the world and shot photographs for National Geographic, once secured a Russian nuclear icebreaker and offered a charter trip for 100 people for a historic voyage "beyond the North Pole." His expedition was supposed to have happened in 2007, but unfortunately, Currey died unexpectedly in 2006 of a brain tumor. Then another expedition was planned by Brooks A. Agnew, whose company, Zegrahm Expeditions, specialized in three-week cruises into the Antarctica, South Georgia and Falkland Islands. Agnew maintained that a major film documentary company agreed to finance this strange voyage, scheduled to occur in the summer of 2013. He said he would be accompanied by a film crew and a team of researchers, plus about 100 people willing to pay for a cabin aboard the chartered icebreaker. But alas, Anew resigned from his position and that expedition never got off the ground. Currey, who appeared to have been much more serious about his project, planned to go to 84.4 N. Latitude, 141 E. Longitude and "resolve once and for all whether the hollow earth theory has any validity." His expedition was expected to depart Murmansk, Russia, on June 26, 2007. The icebreaker was to head north to the geographic North Pole north of Franz Josef Land. From here the ship was to direct its course toward the New Siberian Islands on Meridian 141 East Longitude. "It is estimated that within about 600 miles from the North Pole on this meridian the expedition will reach the open ocean of inner earth," the original promotional article said. "If we are successful in finding the polar opening, then within 1,700 miles from any farthest north Arctic land bordering the Arctic Ocean, we should reach the inner continent just as Admiral Richard E. Byrd did on his 1947 flight beyond the pole." The story continued: ". . . the admiral and his airplane crew accomplished a physical flight of seven hours duration in a northerly direction beyond the North Pole. Every mile and every minute of that journey beyond was over ice, water, or land that no explorer had seen . . . as progress was made beyond the Pole point, there was observed directly under the plane’s course ice-less land and lakes, and mountains where foliage was abundant. Moreover, a brief newspaper account of the flight held that a member of the admiral’s crew had observed a monstrous greenish-hued animal moving through the underbrush." After that, the story gets really incredible. It suggests that the lost tribes of Israel is living in the hollow core of the Earth, that their leader is a descendant of King David, and that the capitol city is a place called Jehu. The price tag for this strange adventure was $19,000, and Currey made no promises that the expedition will find the entrance to the hollow earth. The fee covered hotel accommodations, the trip on the ship which is described as a floating palace, meals, lectures and helicopter trips to look at points of interest. The bottom line: "At all times the expedition will be at the mercy of the weather, ice and sea conditions," the promotional article concludes. Books have been written claiming that explorers to the North Pole, including Admiral Richard Byrd, have all seen this hole in the earth that connects to a hollow world inside the planet. Thus there are people today who actually believe that a second world exists inside our own, with a second sun burning at the core of our globe. One story talks about explorer Olaf Jansen who sailed northeast from Murmansk, Russia, squeezed his vessel through a lead in the ice on July 1, 1829 and accidentally entered the North Polar opening. Amadeo Giannini’s book World Beyond the Poles told how Admiral Richard E. Byrd flew in 1947 beyond the North Pole and over a "land beyond the pole." Other books on the subject include The Hollow Earth by Raymond Bernard, 1979, and Etidorhpa, by John Uri Llyod, 1890s. The latter was a story about a person that traveled to the "Inner Surface" of the Earth. Bernard describes the Earth as a large hollow ball with a crust about 800 miles thick. He maintains there are two openings, 1,400 miles wide, at the North and South Poles. At the center of the earth is found an inner sun rather than a molten iron core that is 600 miles wide. Bernard’s inner world and outer world is divided by a third, middle earth filled with caverns, tunnels and inner cities. Llyod reports that as people travel down toward the center of the earth, gravity produces less and less of an effect until they reach a point where there is no gravity. At this point, he says, people can then travel around by mere thought. When there, the heart no longer beats and individuals no longer need to eat. Because there is less gravity, vegetation that grows in the inner earth becomes extremely large. All of this seems to have gone completely unnoticed by NASA scientists, despite the fact that NASA astronauts have flown countless missions around this planet, photographing every inch of it. One would think that holes 1,400 miles wide at the two poles would have been captured on some of that film. Of course, the Hollow Earth people probably think NASA is covering up what it knows about these massive holes as part of yet another great government conspiracy. More stories lie ahead this week about the probabilities of a world that may or may not exist under our feet. It is a strange part of human mythology that has been with us for as long as anyone can remember.